The high-potential cropping land on AC van Wyk’s farm is characterised by a light, sandy soil with a depth of about 2m, which rests on top of a dense clay layer that retains water. 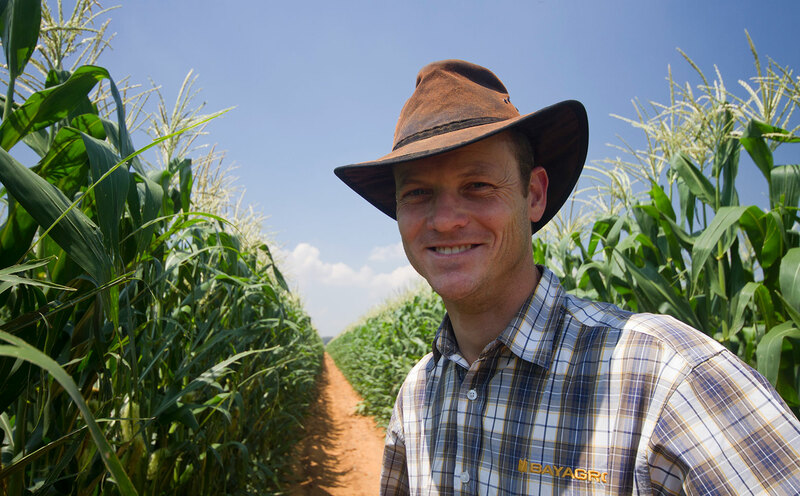 Maize producer AC van Wyk does his job well. So well, in fact, that he has grown the area under maize on his farm from fewer than 300ha in 2002 to over 9 000ha. AC, who is Grain SA’s Producer of the Year for 2017, is the seventh generation on the farm Warmhoek, where his forefathers began as subsistence-level farmers. However, his grandfather, also called AC, was more focused on sheep production, while his father, Coen, was passionate about his commercial Simbra herd. AC obtained an honours degree in agriculture and management, after which he worked in the US in the agriculture sector. In 2002, he returned to Warmhoek to join his father in the business. “At that stage we were planting crops on about 280ha,” he recalls. Today, 94% of his turnover comes from grain production, mostly maize, while the remainder is generated by backgrounding, or production of oxen, which according to AC is the ideal complement to his cropping activities. In addition to the arable lands, he has access to 4 000ha of natural grazing land, of which 700ha are rented. “We have about 9 200ha of arable land under management. Of that, only about 2 300ha are our own land. There’s a good synergy between the two farming divisions,” he says. AC describes his father as a brilliant manager with a good grasp of technicalities, but not an enthusiastic entrepreneur. “He’s not the type of person who likes taking risks,” he says. After his return to the farm, AC gradually took over production matters on the land, while his father spent more time in the office and managing the finances of the business. “Although our personalities differ, we got on well without getting under each other’s feet,” he recalls. AC started leasing more land for maize production, while his father began scaling down his involvement. They also decided to move away from cattle breeding and concentrate on the more flexible backgrounding operation. This enabled them to buy or sell weaners at any stage without the threat of losing years of carefully bred genetics. By about 2010, his father had stepped down from most of the day-to-day running of the business. They employed an office manager for a few years, before AC’s wife, Lizelle, took over this role, in collaboration with a bookkeeper. AC believes that the simplicity of his business operation sets it apart from most others. He follows a volume-driven maize approach, with the crop comprised entirely of white maize. This past season, he planted 6 400ha to three tried and tested DEKALB cultivars (DKC 77-77, DKC 77-85 and DKC 78-87), producing 40 000t of maize. He used to include wheat in his planting schedule on a rotational basis, particularly due to the soil health benefits, but has stopped this for financial reasons. He sometimes plants a small sunflower component (less than 500ha), increasing this when it is not possible to plant all the intended maize hectares. AC employs about 30 permanent staff and four cropping managers. He operates a fleet of 30 John Deere tractors and several Claas harvesters. He has also built a number of his own implements to customise and save on costs. An on-farm, 2 500t silo is used to streamline logistics, but not for long-term storage. According to AC, maintaining stored maize requires a particular set of skills to ensure that quality is maintained, and it also poses a security risk. He has further streamlined the business by focusing on only a few large transactions; virtually all of the maize is sold through Senwes. “We pay a premium, but it enables us to keep our attention on what we’re doing and do our part correctly,” he says. About 60% to 70% of the lands under AC’s management are what he terms the “ideal” type of soil for dryland maize production. The sandy soil of a depth of 1,8m to 2m, sits atop a dense clay layer; as a result, rainwater filters easily through the sandy layer and into the clay layer, where it is absorbed to serve as a water reservoir. His topsoil has only about 5% clay content, but he says the view that sandy soil cannot become compacted is a misconception, and he carries out a deep rip to loosen the soil beneath the surface. He avoids disking or ploughing in an effort to limit soil disturbance and retain organic matter as much as possible, but a complete no-till system is not viable. In the run-up to the summer cropping season, many farmers thought it would be better not to plant at all. However, AC believes that for a business to stay on track, it has to remain productive and continue using all its resources, including land, machinery and staff. He therefore went ahead with planting. The first reason for going ahead, he explains, is that wind can cause serious damage to sandy lands if these are left fallow. The second reason, according to AC, is that it simply makes good business sense. As long as one plants and remains productive, there will be options available to explore, but if one doesn’t plant, there is nowhere to go, he says. AC developed his planting plans in August/September, but had to revise his strategy several times throughout the season. He and his team had planted only about 20% of the intended crop before December, but then halted further planting activities as anticipated rain failed to materialise. “That was a difficult situation to manage. Just about every day I sat down and looked at my risks and what could be done. I then had to adapt to that,” he recalls. Good rain finally fell on 22 December, and from then until 31 December, they planted about 5 500ha. AC stresses that he and his team did not stop working when the rain failed to arrive; they kept on preparing the lands, spraying if any weeds appeared. In short, they made sure they would be ready for when the rain finally came. According to him, the art of dryland grain and oilseed production lies in adaptation. For example, he does not usually plant much sunflower, but this year has upped plantings from an intended 500ha to about 2 500ha. This is because the planting window for sunflower closes later in the season than that of maize. In a difficult year, he explains, the focus must shift from making a profit to ensuring that the returns are at least high enough to allow planting to go ahead again in the next season. AC admits that he is not anticipating a profitable year. Instead, he is focusing on getting through the year without too great a loss, so that he can produce a good harvest when the price rises. He remains positive, saying at the end of a long downward swing that things can only start moving up again. Email AC van Wyk at acvw@lantic.net.